The Oprah Winfrey Network launching Saturday is wary of promising too much of a good thing – Winfrey herself. In stoking interest in the cable channel, the goal is to exploit Winfrey’s popularity while emphasizing that OWN won’t be all Oprah, all the time. “We really don’t want to be a niche brand. We want to be a mainstream cable” network with appeal beyond Winfrey’s fan base, said Darren Schillace, vice president of consumer marketing for OWN. “Phase one” of the marketing effort aims to “manage expectations that it’s not 24/7 Oprah on the network,” Schillace said, with Winfrey committed to appearing in at least 70 hours of programming in 2011. Helping viewers find OWN on the nation’s various and crowded cable systems is another key goal in spreading the word about the joint venture between Winfrey’s Harpo Inc. and Discovery Communications. The effort to position OWN as Oprah-plus doesn’t mean barring Winfrey, or her famous pals, from the premiere hoopla. And it hasn’t led to understated promos for the reportedly $189 million gamble by Discovery. “Watch our stunning and heart-pounding new video featuring so many stars and so much energy that it will leave you breathless,” gushes the online heart of Planet Oprah, Oprah.com, in a section devoted to OWN. The media queen herself is central to an OWN ad that debuted in movie theaters, vowing to bring her talk show-crafted message of self-empowerment to the channel’s bigger canvas. 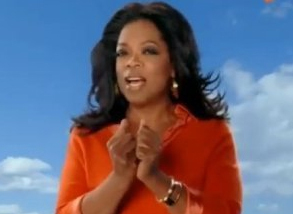 “What if I could take every hero who inspired me, every lesson that motivated me, every opportunity that was ever given to me and give it to you,” says OWN chairman Winfrey, beaming prettily against an unreal blue sky dotted by soaring balloons and puffy clouds.